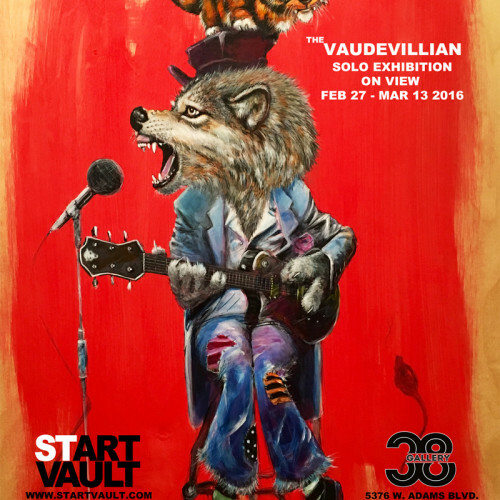 The Vaudevillian exhibit, which will be on view at Gallery 38 in West Adams February 27th through March 13th, is the beginning of a story about a traveling Vaudeville show where the characters are a mesh of fantastic animals, humans and animal human-morphs. Mixing timelines between the Roaring 20s and Modern times, these characters are from Crawford’s imaginary world, where animals and humans are equal in their quest to create lasting artistic experiences while making a world that is more beautiful and full of laughter. This show, at first glance, is light and whimsical, although if you look closer, viewers will find signs of dark under tones in the entertainment business. Art fans enthusiasts and collectors are welcomed to enjoy the opening reception of “The Vaudvillian”, this February 27th from 7pm – 10pm at Gallery 38 at 5376 W. Adams Blvd Los Angeles, CA 90016. Entrance is free with RSVP. Brett Crawford, started making art again in 2013, after a 13 year hiatus. Based out of San Clemente, an auto didactic artist his style of painting, illustrating, sculpting are influenced by comics, movies, music, social issues, graphic novels, and artist from renaissance era to the current new contemporary movement. His love for art history and the excitement of working with today’s street artists, propelled Brett to pick up the brush again and get back to what he loved. Crawford’s latest exhibits include, “Peep Show” an Illustrators showcase which was featured at Yerba Buena Center for the arts San Francisco, CA, “Vinyl” at Wonderland SF Gallery in San Francisco, CA, “Kaaboo” in Del Mar, CA and most recently, “Manifest Justice” in Los Angeles, CA. Brett is known throughout the Los Angeles art scene for his wonderful and unusual print recreations for some of the most sought after street and new contemporary artist in the industry. * select preview pieces are available now in our online gallery.